New to histamine intolerance, mast cell activation or mastocytosis? 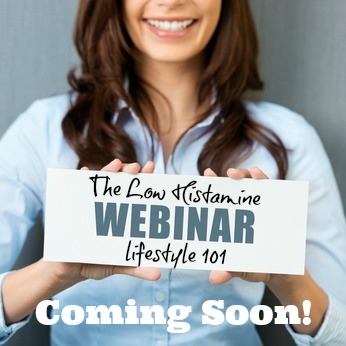 Wondering how to get started on low histamine/antihistamine & anti-inflammatory diet? Fret not! I’ll be sharing my tips, tricks and survival strategies with you next month in my very first webinar! Thanks to those who voted over the last few weeks, the topic will be: the Low Histamine Lifestyle 101. Not only is this webinar FREE, but you’ll receive a very special gift from me. I’ll be keeping this first webinar quite small, so please sign up to my mailing list to be the first to know when I open registration! If you can’t wait that long, check out my books for more information on how I stay meds free despite being diagnosed with mast cell activation disorder and the high nutrient antihistamine and anti-inflammatory diet I employ to stay healthy.